3 bands, 6 cities, 1 train, and thousands of miles of track…the BIG EASY EXPRESS documents a cinematic musical journey. Directed by renowned filmmaker Emmett Malloy (THE WHITE STRIPES UNDER GREAT WHITE NORTHERN LIGHTS) this incredible new film captures nothing less than history in the making. 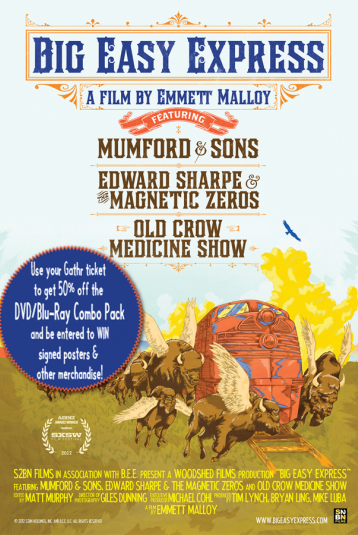 Indie folk heroes Edward Sharpe & The Magnetic Zeros, Tennessee’s Old Crow Medicine Show, and Britain’s acclaimed Mumford & Sons, climbed aboard a beautiful vintage train in California, setting out for New Orleans, Louisiana on a “tour of dreams”. The resulting film from this journey is nothing short of magical. Part road movie and part concert film, BIG EASY EXPRESS bears witness to the birth of a new musical era. With poignancy and beauty, Malloy documents these incredible musicians as they ride the rails and wow the crowds, from Oakland… to New Orleans. So climb on board for a vibrant, raucous railway adventure. Filled with joyous crowds, late night laughter, endless music…and a train that was bound for glory.